So for you who haven't heard about Avoskin, let me tell you about it a little. 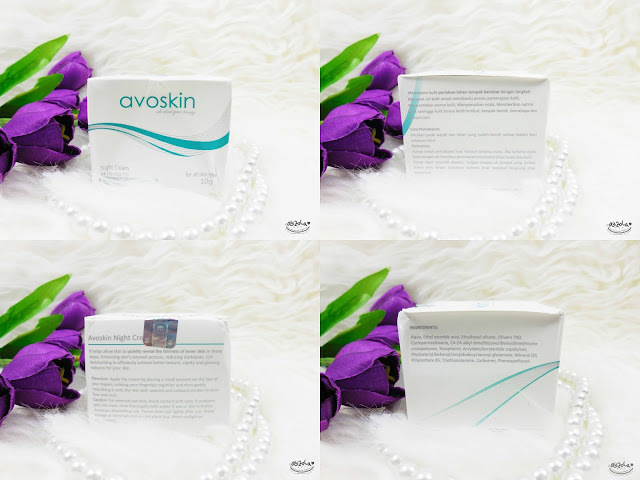 Avoskin is a cosmetic range made in Indonesia under CV. Nossin Indonesia. Yes, guys! This one is another skincare made in Indonesia and i'm so excited to try it! 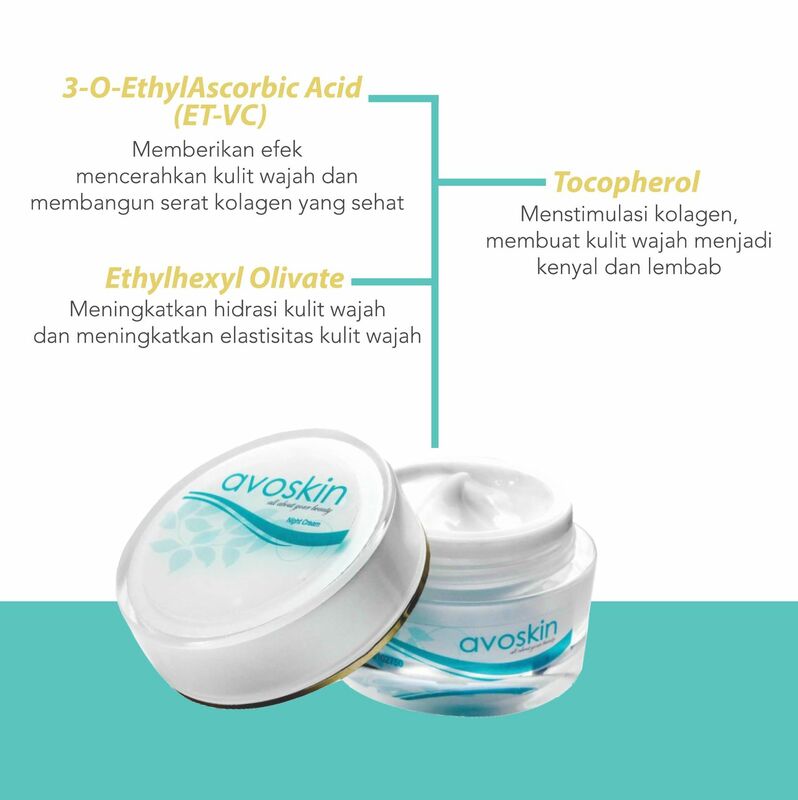 Anyway, Avoskin especially formulated for any skin type, with Avocado as its main ingredient. Avoskin also already got BPOM certificate, which means this skin care is safe to use, also they claim the product do not contain Mercury and Hydroquinon, so i think it's safe to use. 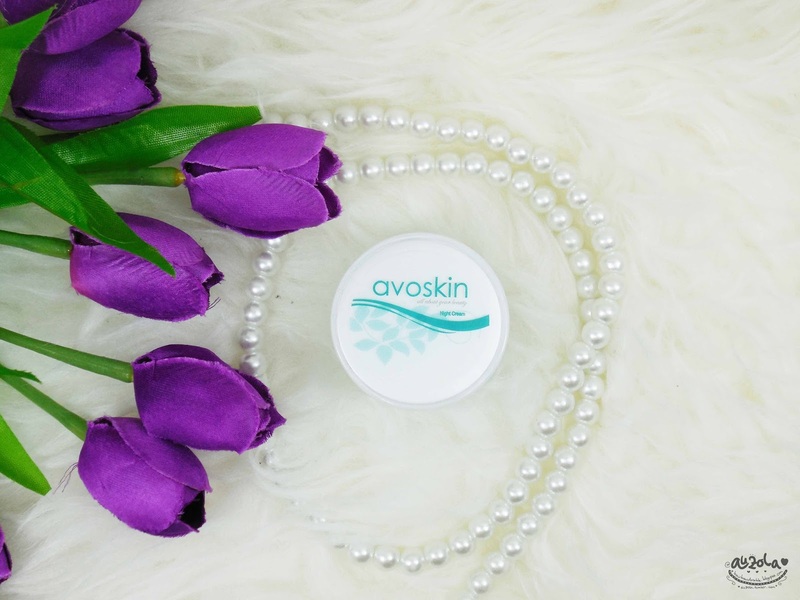 Avoskin has a few range of skin care and body care, from day cream, night cream, facial soap, antioxidant spray, and also has this traditional body scrub. The one that i tried is the night cream. 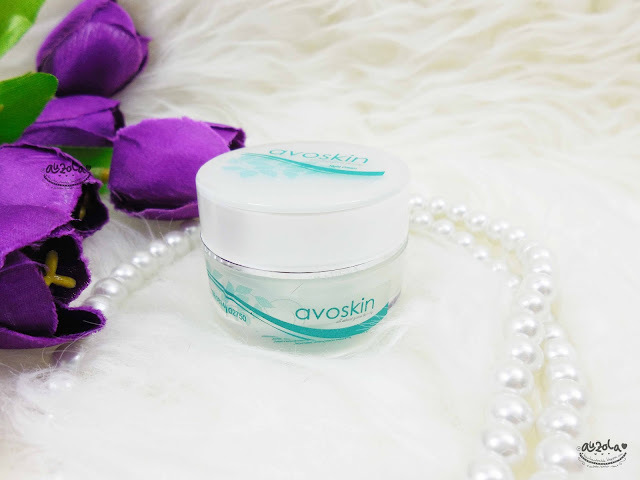 Avoskin night cream helps to maintain your skin and repairs it while you sleep. It contains 3-O-EthylAscorbic Acid (ET-VC) that can help brighten your skin and help building healthy collagen fibers, Ethylhexyl Olivate that can hydrated the skin and makes you skin more elastic, and Tocopherol to stimulates collagen which makes your skin moist and elastic. Avoskin night cream also has this skin lightening effect. It can brighten and regenerate, that can help reduce wrinkle and improve skin texture. Brightening complex helps to even out skin tone. 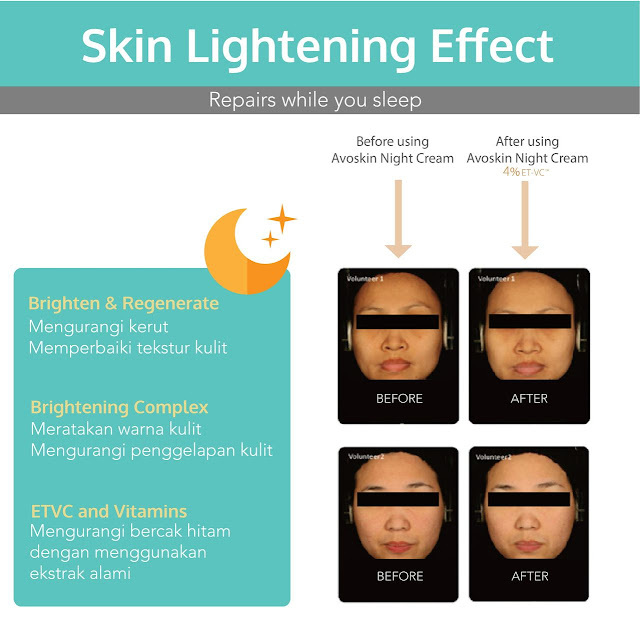 Then ETVC and vitamins help to reduce dark spots. Nothing special about the packaging, white box with blue combination. You can read the ingredients, how to use, etc on the box. It also has seal on the box like as you can see in the picture. Anyway the box is a bit dented because my cat sat on it hahaha. Ingredients: Et-VC (3-O-Ethyl Ascorbic Acid), Tocopherol,Water, Phytosteryl/Behenyl/Octyldodecyl Lauroyl Glutamate, Cyclopentasiloxane, Ethylhexyl Olivate, PEG-4 Olivate, C4-24 Alkyl Dimethicone/Divinyldimethicone Crosspolymer, Polysorbate 85, Olivem 700, Triethanolamine, EC-1, Phenoxyethanol, Carbomer, Avocado Extract, Parfume. 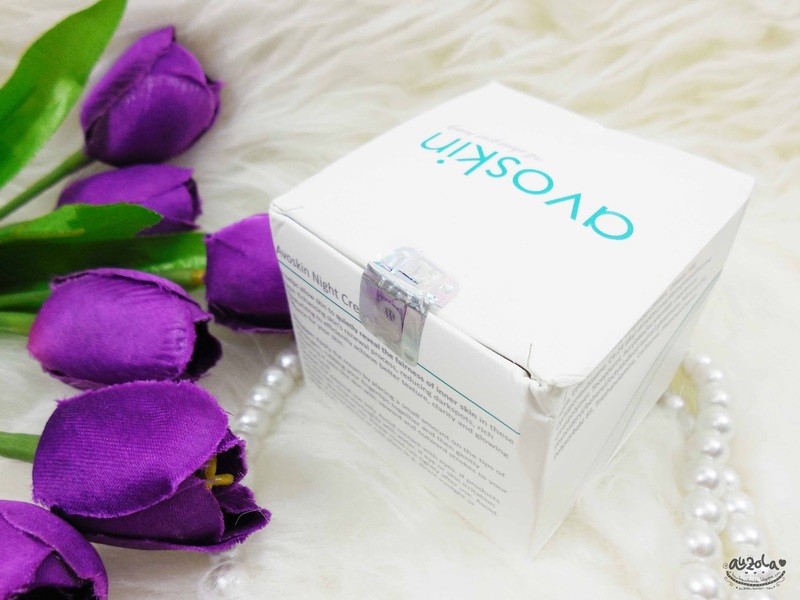 How to use: apply the cream by placing a small amount on the tips of your fingers, rubbing your fingertips together and then gently smoothing it onto the skin with upward and outward strokes to your face and neck before going to bed. Caution: For external use only. Avoid contact with eyes. If products gets into eyes, rinse thoroughly with water. If eye or skin irritation occurs, discontinue use. Don't forget to close the cap tightly after every use and store it on room temperature (avoid extremely hot or cold place). What's inside, one small jar with also white and blue colors. Quite small as it only contains about 10gr of night cream. It has other cap inside, so make sure you close both caps carefully so the product will stay longer and not contaminated. Really, dont forget to close the cap tightly as the cream will easily get dry up when you dont put the cap (at least thats what happen to mine). The texture is nice, watery and easy to absorb on my skin. It really absorb fast to be exact, so you need to blend it fast on your skin. Use it at one part at a time. I like the nice feeling after using this cream, light and almost like using nothing. But it kinda sting on my acne (the ones that injured because i pop them). Only sting a little though, so it was fine. So far it's good on my skin. But i know every product works differently on different people and it takes time. So for a month using this night cream i still say i quite like it. It does moisturizing my skin quite well, even though at first i kinda doubt it because it's quite watery, but it turns out making my skin moist and feel more elastic, since i notice the some lines at the outer corner of my eyes are better. It also doesn't make my skin looks or feels oily in the morning. I love having a moist face when i wake up instead of oily face and Avoskin night cream really help with this. I also feels my skin looks brighter. As for my acne, it was a bit better at first, but then the monthly guest came and tada, more acne. But i guess it quite helps with acne even though it doesn't really get rid all of my acne. Oh, it kinda sting when applied on acne that just pop or wounded skin, so be careful if you have tons of acne like me hehhee. Well, it's not that hurt though, it only feels like when i applied lemon on my acne, something like that, less hurt and only for a quite while, after that i doesn't feel anything anymore. Anyway because the point of this night cream is for elasticity and moisturizer, im not hoping much that it can cure my acne though. As for the dark spot, i haven't see anything yet, but maybe i need to use it longer because dark spot it's not really easy to get rid of. Anyway i don't really have a picture of before after using because suddenly i got this massive acne attack because of the monthly guest, so i can't really show you how it works on me. But i think it's still good, especially for maintaining skin elasticity and moisture. So just like most skin care i used, this one is also good on me, because it didn't cause any weird skin problem and quite helping my skin. But i know i need to give more time for this skincare to perform better, so for a month i guess this Avoskin Night Cream is good. You can give it a try if you want, i quite recommend it. Just make sure you're at least 15 years old or older. That's all for now, i hope you enjoy this review, see you guys on my next post!